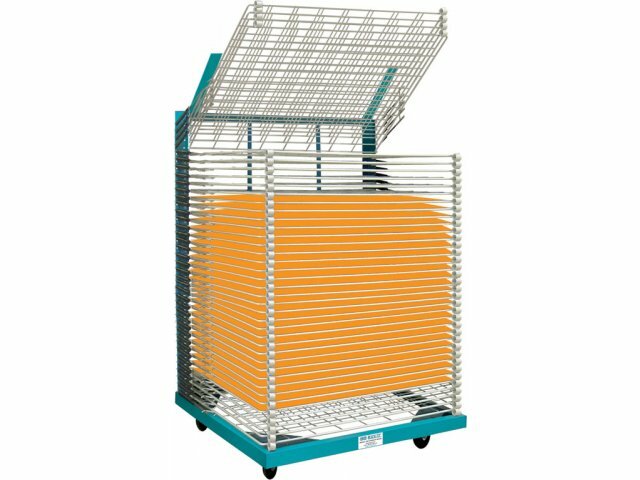 Heavy-Duty Drying Rack - 40 Shelves 26"x36"
When you have a quantity of small-size projects such as those made by preschoolers or kindergarteners, this rack is perfect for drying projects in an organized and neat way. Built on a welded steel frame, 40 shelves provide a safe and sturdy resting place for a large number of projects as they dry. Longer lasting than rubber, steel bumpers come standard on all heavy-duty racks. They are welded on the exterior of the shelf so as not to compromise drying room. For smooth up/down operation, the individually adjustable shelf springs have a tension control feature. For long life, all shelves feature a rust- and solvent-resistant, powder-coated finish. 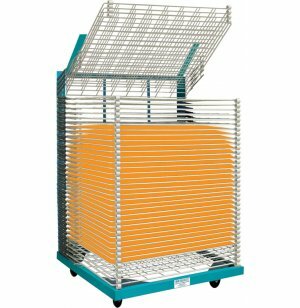 To promote quick evaporation, racks come with non-warping shelves spaced at 1" intervals. Ultimate Durability: For long-lasting use, racks boast a welded steel frame and shelves are powder coated, with a rust and solvent-resistant finish. Wire-reinforced shelves and sturdy steel bumpers between the shelves ensure neat, stable stacking of your projects. Adjustable Use: Shelves are individually adjustable, with a tension control feature for extra-smooth operation. Speedy Drying: Shelves are well-spaced to promote efficient and quick evaporation drying of art projects.